I swore I wouldn't buy another one. It was an accident. My finger accidentally hit the button to buy-it-now, and suddenly it was mine, all mine. 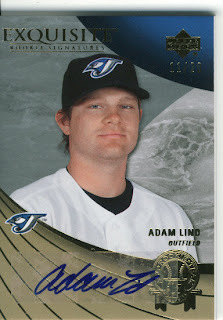 I picked up a 2007 Exquisite All Rookie Team Adam Lind autograph serial numbered 11/20. I know, I know I wasn't supposed to buy any more of these, but in case you didn't know I have a problem... I do. Now the second card I got was from the same seller, and since he was offering free shipping on the Exquisite card I e-mailed asking if he would ship both in the same envelope for free. He agreed, and there I was accidentally clicking buy-it-now yet again. This card I wanted pretty badly because it is signed on card, and I don't have any Lind cards signed on card. 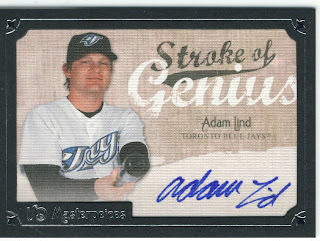 it is a 2007 Masterpieces Stroke of Genius Adam Lind autograph. With the free shipping both cards cost under $10 delivered, which is sweet. I used a little bit of the profits from selling 2 of my Opening Day tickets to pick these bad boys up and cheer myself up for not being able to sit in my seats. That's my best excuse for now. It looks like he's holding an aluminum bat on the Strokes of Genius card. oddly he has the same pose, only smiling on the 2007 SP Rookie Edition auto I posted not too long ago, and the same bat. Why would he pose like this and not just have it on his shoulder or something? Now you are making me think.... Boo.